Along with Terry Richards, he is one of only two actors to appear in both of the "James Bond" films released in 1967: Casino Royale (1967) and You Only Live Twice (1967). Kwouk was born in Warrington, Cheshire, but was brought up in Shanghai until he was 17 years old, when his Chinese parents returned to Britain. He went to the United States to study and in 1953 and graduated from Bowdoin College. The Kwouk family fortune had been lost in the 1949 revolution and in 1954 he came back to Britain, where a girlfriend, he said, "nagged me into acting". One of Kwouk's earliest film roles was in The Inn of the Sixth Happiness (1958) where he played the leader of a prison revolt who later aids the main character in heroically leading orphans to safety. Kwouk has appeared in numerous films and TV programmes. He may be most famous for playing Cato Fong, Inspector Clouseau's man-servant with Peter Sellers in A Shot in the Dark and The Pink Panther films. 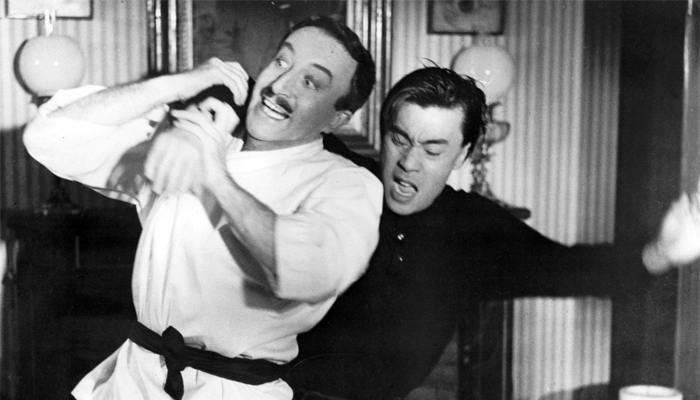 The running gag was that Cato was ordered to attack Clouseau when he least expected it to keep him alert, usually resulting in Clouseau's flat being wrecked. Amid the chaos, the phone would ring and Cato would calmly answer it with "Inspector/Chief Inspector Clouseau's residence," before dutifully handing the phone to his employer (pictured with Sellers below). A reference to his appearances in the Pink Panther films with Peter Sellers is found in the opening scene of The Fiendish Plot of Dr. Fu Manchu where Sellers says to him "your face is familiar." Burt Kwouk makes a guest appearance in The Avengers third series episode Lobster Quadrille, the same year Cato was introduced in A Shot in the Dark with Peter Sellers. Kwouks very first Avengers appearance was in a lost Keel episode, and hell be back again in The Cybernauts. He was a stalwart of several ITC television TV series, including Danger Man, when an oriental character was required. Kwouk has appeared in three James Bond films. In Goldfinger (1964) he played Mr. Ling, a Red Chinese expert in nuclear fission; in the spoof Casino Royale (1967) he played a general and in You Only Live Twice (1967) Kwouk played the part of a Japanese operative of Blofeld credited only as Spectre 3. In 1968 he appeared in The Shoes of the Fisherman opposite Laurence Olivier and Anthony Quinn. Kwouk also appeared as the honourable but misguided Major Yamauchi in the 1980s World War II television drama Tenko. 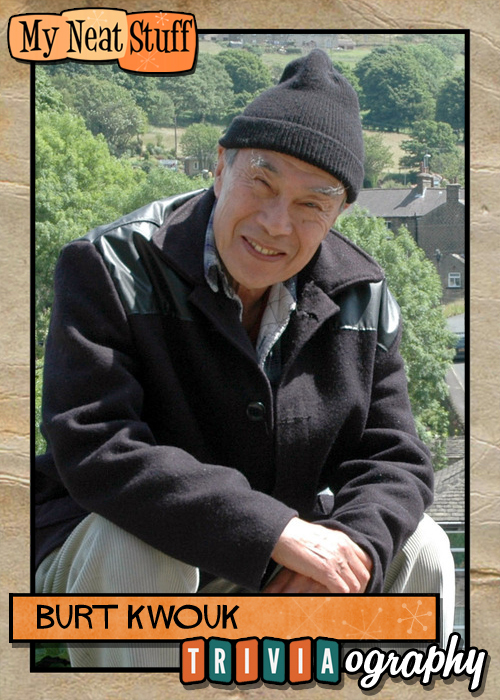 Kwouk featured in many UK television productions that called for a man of Oriental appearance. As a result, he became a familiar face in the United Kingdom and appeared as himself in the Harry Hill Show as well as several of Hill's live tours. In 2000 he appeared in an episode of the syndicated western TV series Queen of Swords playing Master Kiyomasa an aged Japanese warrior priest starring with Sung-Hi Lee who played his female pupil Kami. Filmed at Texas Hollywood, Almeria, Spain. From 2001 to 2004 he provided voice-overs on the spoof Japanese betting show Banzai and subsequently appeared in adverts for the betting company, Bet365. From 2002 to the show's end in 2010, he had a regular role in the long-running series Last of the Summer Wine, as Entwistle (20022010). His later work also includes voice acting in the audio theatre and video game genres. In 2010, he provided the voice of the CGI character Shen, a Chinese water dragon, for the groundbreaking BBC TV fantasy drama series Spirit Warriors. He was appointed Officer of the Order of the British Empire (OBE) in the 2011 New Year Honours for services to drama.